The RV River Kwai carries a maximum of 20 passengers in 10 teakwood cabins (single deck) and operates on a 4 days/3 nights year round program every Monday-Thursday and Thursday-Sunday on both Upstream and Downstream programs alternately. 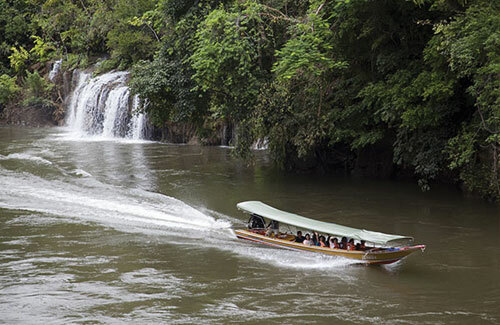 The RV River Kwai opens up an entirely new area for golf-enthusiasts and river tourism in Kanchanaburi province west of Bangkok. In the early mornings, we offer the tee-off golfs at the selected golf courses, and the afternoon at leisure on the boat or with the land excursions to visit attractions along the river including historic sites, waterfalls, war cemeteries, hot springs, the bridge on the River Kwai, and local attractions. PLEASE KINDLY NOTE ALL BELOW MENTIONED GOLF COURSES CAN BE ALTERED SUBJECT TO ITS AVAILABILITY WHICH OUR GUIDE WILL KEEP GUESTS INFORMED ON SPOT AT SHORT NOTICE. 06:00 Depart from Bangkok by private car/ minibus/coach to Kanchanaburi. 08:30 First day’s golf is at the Mission Hills Golf Club Kanchanaburi, one of the most beautiful courses in western Thailand. The fairways are lined with thousands of mature palms, the course itself winds round gently sloping hills and the clubhouse, clad in timber, make this a truly sensation golfing experience, and a great way to finish a tour of this fascinating region of the country. 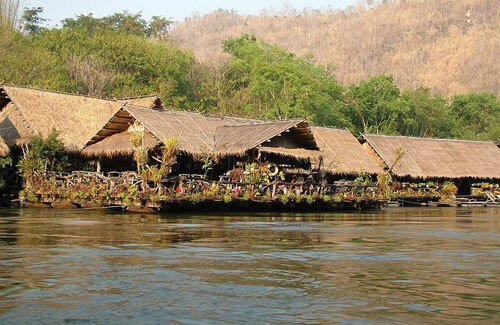 13:45 Embark RV River Kwai at Nong Ya dock Lunch on board while cruising on Kwai Noi River. 15:00 Proceed by coach to visit Somdet Phra Sri Nakharin Park, located in Kanchanaburi Agriculture College. It is known as “Stone Garden” covering 200 rai (96 acres), since most of its area is scattered with stones of different sizes and shapes, similar to animals. 07:00 The golf tour begins at the Evergreen Hills Golf Club & Resort, located in one of Kanchanaburi’s many beautiful jungle covered valleys. The course in not too long and welcomes players of mixed ability. Water comes into play on many of the holes and a long dog-leg par-4 17th is a course favorite. 07:00 Today’s golf is at the River Kwai Golf & Country Club. Very rarely will you find a golf course in Asia with as stunning a backdrop as the River Kwai Golf & Country Club. This beautiful 27-hole golf course, which can only be reached by ferry – lies in front of Kanchanaburi’s exciting mountainous peaks and relies on an abundance of local and imported flora and trees to brighten uo its fairways. It incorporates water hazards on most of its holes, has the occational blind green and in many instances the golfer will have to rely on a long tee shot to clear its charms. 13:30 Lunch on board while cruising upriver, passing Sai Yok Yai Waterfalls. Afternoon at leisure on the boat. 07:00 Offering foods to monks (making merit in Buddhist style) at nearby temple. 10:00 Disembark and return to Kanchanaburi by coach. Visit the Thailand-Burma Railway Center Museum, an interactive museum which provides a remarkable research and information centre dedicated to presenting the story of the Thailand-Burma Railway. Also visit to the Donrak War Cemetery which contains the remains of 6,982 Allied prisoners of war who perished during the construction of the “Death Railway”. Continue to the world-famous bridge over the River Kwai. The sturdy Iron Bridge spanning the River Kwai Yai, which was a crucial part of the Death Railway, was built in some 16 months by Allied prisoners of war and Asian conscripts. The bridge was destroyed in Allied bombing raids towards the end of World War II and was later rebuilt by the Japanese as war reparations. 18:00 Arrive Bangkok and transfer to your hotel in Bangkok downtown. 06:00 Depart from Bangkok by coach to Kanchanaburi via Nakorn Pathom. 14:00 Lunch at Sommai Restaurant. 15:00 Continue to Thong Pha Phum. If time allows, visit to Vachiralongkorn Dam, an immense lake created from the waters of three rivers harnessed by the hydroelectric dam which stretches to the far horizon. The thick jungle through which the railway line cut a swathe in recent times has been tamed and the surrounding fertile land now supports agricultural crops – sugar cane, tapioca, tobacco, maize and cotton. The admirable rugged scenery of the lake set against rolling hills on the distant horizon is ample reward for the long journey. 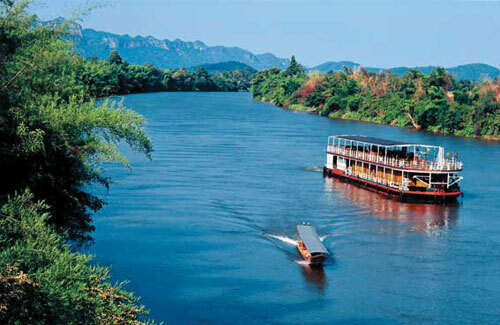 16:30 Embark on RV River Kwai at Daowadung Bridge and cruise downstream on the Kwai Noi River. 07:00 Heading off to the Nichigo Resort & Country Club, which actually features three courses. The fairways are wide and although water has been used sparingly, the challenge ahead is indeed interesting. 15:00 River rafting or canoeing downstream on Kwai Noi River. If time allows, visit nearby the Mon Village. (Optional: Enjoy one hour Thai Traditional massage – Extra: Baht 500.- per person) Afternoon at leisure on the boat. 07:00 Today’s golf is at the Grand Garden & Golf Club, set amongst Kanchanaburi’s beautiful rugged mountains hills and relies on water for most of its hazards, providing an interesting test of golf.From the greens to the fairways, the ten-year-old course is always in excellent condition and thus an enjoyable course for all class of players. Return to boat for lunch. 14:00 Lunch on board while cruising downriver. 15:15 Continue by coach to visit the Indochinese Tiger Conservation Project at Wat Pa Luang Ta Bua (Forest temple). This forest temple has a wide area of 438 rai (700,800 square meters) in natural scenery lively with so many kinds of wildlife such as peacock, deer, gibbon, wild boar and etc, and where we can see how the tigers befriend with the monks. 18:00 Rejoin RV River Kwai at Wat Yang Ko, and cruising downriver. 19:00 “Farewell Dinner” and overnight on board. 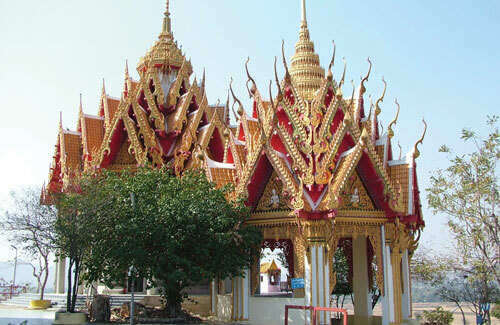 09:30 Continue by coach to Kanchanaburi to visit the world-famous bridge over the River Kwai. The sturdy Iron Bridge spanning the River Kwai Yai, which was a crucial part of the Death Railway, was built in some 16 months by Allied prisoners of war and Asian conscripts. The bridge was destroyed in Allied bombing raids towards the end of World War II and was later rebuilt by the Japanese as war reparations. Continue to the Thailand-Burma Railway Center Museum, an interactive museum which provides a remarkable research and information centre dedicated to presenting the story of the Thailand-Burma Railway. Finally, visit to the Donrak War Cemetery which contains the remains of 6,982 Allied prisoners of war who perished during the construction of the “Death Railway”. – Children of 4 years and older must solely occupy a berth and pay the full rate (same as adults). – Infants below the age of 4 years may sleep in their parent’s cabin without extra charge but parents are to provide own baby food. – NO triple rooms or extra beds are available. – Accommodation on RV River Kwai, meals as mentioned above, coffee, tea & drinking water. – Joint Golf Cruise, transfers by private car (VOLVO) or minivan (TOYOTA HI-ROOF) with a driver (NO GUIDE), whereas sightseeing tours with English, French or German speaking guide (together with other cruise members). – Charter Golf Cruise, transfers and sightseeing tours with English, French or German speaking local guide. – 18-hol Green fees and Caddy fees at the golf course with roundtrip transfers. – Golf carts, Golf Set, Golf Shoes, etc. – Expenditures of a personal nature for bar and laundry. How to make a Reservation: Send e-mail with your request to: rvriverkwai@cocogolf.net and we will be happy to assist you. Cabins 10 deluxe staterooms of 3m x 4m with own shower, water closet, air-conditioned, mini safes, etc. Crew Thai crews plus foreign cruise director.